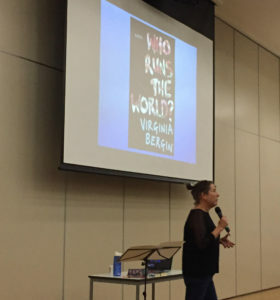 On Wednesday, 19th July, I did my first two Who Runs the World? 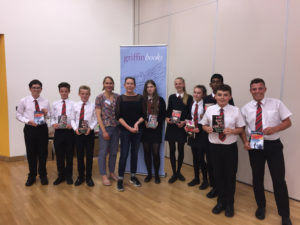 school visits, speaking to 300 Year 9 students at St Cyres, Penarth, and Ysgol Uwchradd Caerdydd/Cardiff High School with support from Macmillan and indie bookseller, Griffin Books. I had no idea what to expect . . . no idea how a story about gender, democracy and justice would go down with a diverse group of 14-year-olds. They were amazing! They listened, they thought . 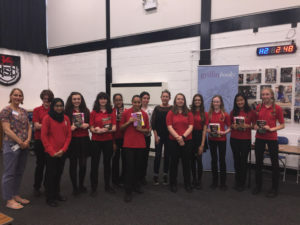 . . they made EXCELLENT comments and they asked BRILLIANT questions, from whether women’s emotions would change, to whether a world run by women would really be that different . . .
Did I have answers? Not exactly . . . 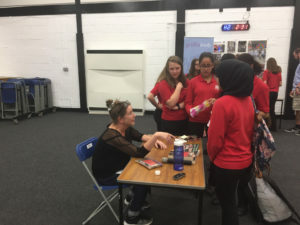 I made it clear at the start: I’m not a teacher, I’m a writer; a story is a way to think about things, to pose questions – but not to find neat ‘right’ or ‘wrong’ answers. Challenging . . . and wonderful. Thanks to everyone who participated!